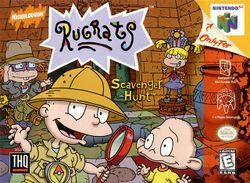 Rugrats: Scavenger Hunt is a party game that was developed by Realtime Associates for THQ, and released on the Nintendo 64, on June 29, 1999; as its name suggests, it is the fifth title in the Rugrats series (and the second featuring multiplayer capabilities). The game was later released under the title Rugrats: Treasure Hunt in the EU on August 10, 1999 - however, only the title screen was changed to account for the new name, and the rest of the game remained the same as the original US version. Scavenge through three games in one! Reptar Rally: The babies visit Reptar on his candy island to help him collect as many sweets as possible. This page was last edited on 11 November 2016, at 16:30.